Lucifer's Friend, for my money, were one of the first true metal bands of the 70's. Their debut self-titled album is pure metal. Not thrash, not hate, not BS attitude, and not stupidly simple three-chord progressions. The album contained MUSIC, real music, in the style of the 1970s that was (and still is) called "heavy metal". After original lead singer John Lawton left them for a gig with Uriah Heep in 1976, the band continued releasing albums, but finally broke up in 1982. Briefly reforming in 1994 for their ninth album (Sumo Grip), by fan request (quite literally), German hard rock band Lucifer's Friend came back together in 2015 - and recorded it! 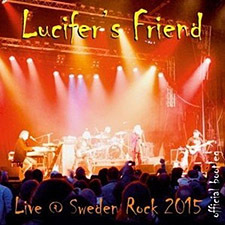 Having recently brought us a brand new Best Of compilation, entitled Awakening, and album that, truthfully, only gave us another small peak into their glorious musical history (although it did contain four brand new tracks), this "Official Bootleg" of Live @ Sweden Rock 2015 captures the band's performance on the 4 Sound Stage on Friday 5th June 2015 as the headline act. The set list includes the band's greatest hits from the 1970s plus songs from the aforementioned recently released Awakening Best Of album. Just know that this is an amazing live show captured on CD, and is a magnificent collection of the bands work. Spanning the groups full career, the audio is crisp, the performances inspired, and at 69 years-old, John Lawton still has the pipes - trust me.